EghtesadOnlinew: Iranian steelmakers and customers in major outlet regions such as the Middle East, North Africa and Asia have started to voice concerns that the US decision to quit the nuclear agreement would have a negative effect on the country’s steel exports and consequently on output. “If Iran has to cut its steel export volumes [because it is] unable to finance deals, it will have to reduce steel output because the domestic market will not be able to consume it, despite recent demand improvements,” an Iranian producing source told Metal Bulletin. European banks foresaw such a situation and some of them, such as Austria’s Oberbank, froze operations a couple of months ago, according to a source involved in trading Iranian steel products. This source spoke to Metal Bulletin on the sidelines of the 78th meeting of the International Rebar Producers & Exporters Association (Irepas) in Poland, earlier this week, Financial Tribune reported. Between 2015 and 2016, Iran’s exports increased by 53% to 5.6 million tons. In 2017, Iran’s steel exports increased by 32% year-on-year to 7.4 million tons, according to information provided by the US Department of Commerce. Semi-finished products accounted for the largest share of Iran’s steel exports in 2017, at 80% or 5.9 million tons. Long steel products made up 10% (748,000 tons), followed by flat steel products at 8.5% (627,000 tons), pipe and tube at 1.5% (113,000 tons) and stainless steel at 0.013% (1,000 tons). 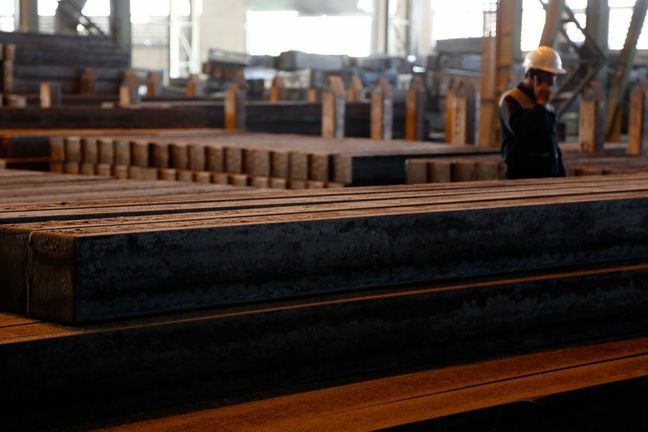 Concerns started to spread in the global steel markets this week that trade with Iran is at risk since US President Donald Trump announced on May 8 that his country will withdraw from the nuclear deal with the Middle Eastern state. In response, the UK, Germany and France called on the US not to take any steps detrimental to other countries that would like the agreement to remain in place. In July 2015, Iran, the P5+1 group (the five permanent members of the United Nations Security Council—China, France, Russia, the United Kingdom and the United States—plus Germany), and the EU agreed on a Joint Comprehensive Plan of Action to allow Iran to continue its nuclear program subject to strict regulation. Under the international agreement, Iran agreed to eliminate its stockpile of uranium and provide regular access to all its nuclear facilities to the International Atomic Energy Agency. In return, Iran received relief from nuclear-related economic sanctions imposed by the US, EU and UN Security Council, including those restricting connection to the SWIFT system for international financial telecommunications. The agreement helped Iran boost its international steel trading volumes, particularly to increase its export activities. This was crucial to the country because of its growing steelmaking capacities. Nevertheless, sources do not expect Iran to completely stop exporting steel. The UAE, which is one of the major buyers and trading hubs for Iranian steel, is expected to continue to buy Iran-origin billet even if sanctions are reimposed. “Iran was purchasing steel through the UAE when it was under sanctions and I believe they will find a way to establish trade if new sanctions are imposed,” a Middle East-based buyer of Iranian billet told Metal Bulletin on the sidelines of the Irepas meeting. “All in all, the UAE needs Iranian billet as much as Iran needs the UAE market to sell it,” he added. The reduction of the available volumes of semi-finished steel from Iran is, however, expected to influence billet and slab prices in the global market, pushing them upward. Buying activity in the Iranian export billet market was lively in the week ended May 16 with customers rushing to place new orders for July-shipment material, especially those in the (Persian) Gulf Cooperation Council countries. They feared that purchases with later delivery dates might be hindered by the threatened reimposition by the United States of trading sanctions against the Middle Eastern country after the US withdrew from an international nuclear-power deal with Iran. The US move has stirred up concerns among buyers of Iranian semi-finished steel products that the purchase of material from the country will be disrupted after July due to difficulties with banking transactions. When the nuclear power deal was first agreed, one result was that Iran was able to access the SWIFT telecommunications network that makes international banking transactions possible. Removal of this access would have significant impacts on Iran’s ability to trade across borders. Nevertheless, (P)GCC-based customers continued to book Iranian material this week. Several cargoes of Iran-origin billet were reported sold within the range of $490-503 per ton FOB. Recent export billet offers from Iranian mills were heard at prices within the range of $500-510 per ton FOB. In East and Southeast Asia, however, no billet bookings from Iran were heard done this week. South Korean customers were also refraining from deals with Iran. But some Indonesian and Thai buyers voiced their intention to continue buying from Iran because they do not have any links to the US. Indonesian customers are currently only willing to accept the prices asked for Iranian material because products from other origins are too expensive for them.